The U.S. Air Force announced earlier in February that it will be swapping out some 5,000 BlackBerry devices for Apple's iPhone and iPad, with the move being a first step in the eventual retirement of all BlackBerry products carried by USAF personnel. The initial Air Force push involves the activation of a mix of iPhones and iPads, while further BlackBerry device replacement will consist of products made by Apple and other approved manufacturers, reports The Air Force Times. "In order to keep costs down and save on network resources, BlackBerrys will be turned in and shut off once the user is transitioned to an iOS device," said Brig. Gen. Kevin Wooton, communications director for Air Force Space Command. While it is unclear if the incoming hardware falls within mobile device management protocols outlined by the Defense Information Systems Agency, the publication said DISA will likely play some role in managing the Air Force devices. In response to the news, BlackBerry issued a statement to CrackBerry, touting the BlackBerry Enterprise Server as the most secure platform in the world. There is a clear reason why BlackBerry has more government certifications than any other vendor, and the only enterprise mobility management vendor and handset maker to receive the Department of Defense "Authority to Operate" certification. Security is built into everything we do, and we've been doing it longer and better than anyone else. We've been a trusted partner to government agencies for more than a decade, and have more than 80,000 BlackBerry devices in DISA alone. Our competitors have not been tested in the field or subjected to the long term rigors of high stress applications, making their security model difficult to trust. BlackBerry remains the best option for governments around the world. Still, since Jan. 1, the Air Force has required personnel who provision a BlackBerry product to retrieve a waiver from AFSPC unit A6, Wooten said. The military arm is apparently pushing hard for system-wide replacement. Apple has vastly expanded its hardware presence in vetted U.S. military applications. 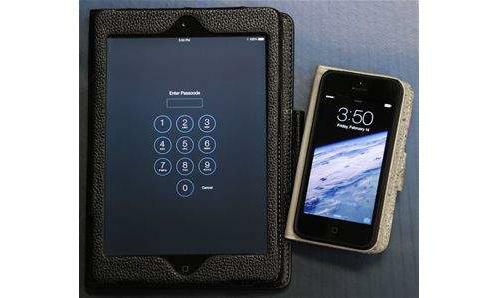 In March of 2012, the Air Force Air Mobility Command awarded a $9.36 million contract to a specialized computer services company for the purchase of up to 18,000 iPads. The Apple tablets are used as electronic flight bags and will save the military branch an estimated $50 million in fuel costs and document reprinting.